This is my second assignment for English Composition Class, on Coursera. It is about making a description of an image, and I tried to use the most trending topic in Indonesia, about President Election. But my topic is about framing the news, that is used both of the media and the candidate’s supporter. Nowadays Indonesian are very busy with the entire president election activities, that will be held on July 9. Everybody has his/her own president idol, and that is why our news full with this euphoria. Why I called it euphoria, because the president’s supporter is almost the same like a hooligans, a mad football supporter from Netherland, and they do not care anything except their favorite team. It was happened now. When every supporter group will make a joke, satire or humiliation about other candidate, and they do not care about others feeling, the courtesy is far away from their mind, and make other group hurt is their purpose. We have two candidates, Joko Widodo and Prabowo Subianto. Each candidate has their weakness and strengthens; they have their past like the track record; and also the future because this week their vision mission already published. All they do, as a part of their campaign, will get attention from mass media and their supporter. The problem is there is a framing. 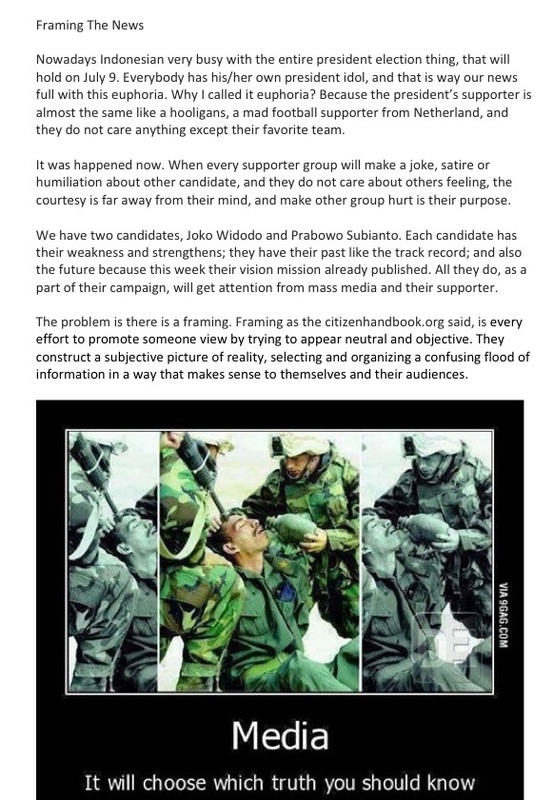 Framing as the citizenhandbook.org said, is every effort to promote someone view by trying to appear neutral and objective. They construct a subjective picture of reality, selecting and organizing a confusing flood of information in a way that makes sense to themselves and their audiences. As you can see in picture above, actually this is what happened. The victim, and clearly he was their enemy, had been caught and felt very weak and thirsty. The soldier gave to drink the enemy, under gunpoint. Media can use it based on their view. If they will make the soldier as a hero, just cut the left side, and take the right side, it was like the soldier is very kind sharing his drink to the enemy. But if the media want to make the opposite, for example the soldier is the bad one, just take the left side, and we got news and picture that related each other, the soldier became the cruel one, even the enemy already suffer, the gunpoint was still in his head. And the media does not only do the practice like this. But also the supporter. Because we have the social media, and blog, and also all the gadget platform, it is very easy to filter and select, which news that we will spread it to our friend, and which news that we like to read. It is a human thing, that we choose the article that supports our opinion. As the citizenhandbook.org said, social movements have increasingly focused on the media since it plays such an influential role in assigning importance to public issues. But gaining attention alone is not what a social movement wants. The real battle is over whose interpretation, whose framing of reality gets the floor. Why the media did it? I think there are two reasons, the first is the media already owned or paid by the candidate or one of their supporter. Other is because of the demand. The supporters need good news from their favorite candidate, but not for the competitor. That is why the media will adjust supply (news) with the supporter’s demand. The participants, the supporters who are not paid by the candidate or their party, will do this practice by themselves. They feel very happy if their friends give ‘like’ to their post, give a positive comment, to whatever they posted in their social media. Also, it is like a small winning to the competitor, either it was a good news for their candidate, or a bad news for the competitor. And that is the reason; why we can find it everywhere, the unfairness news like the soldier picture, as long as we are still immature in our politics action.